Spring is just around the corner. This year it seems like winter and spring have been taking turns in our neighborhood weekly. The temperature has gone from below freezing to close to 50F and back down again every week. Our tulips have started to push themselves above ground. I wish they wouldn’t do that. There is at least a month and a half of winter weather left and if Mother Nature remains angry at us, it may snow in April. 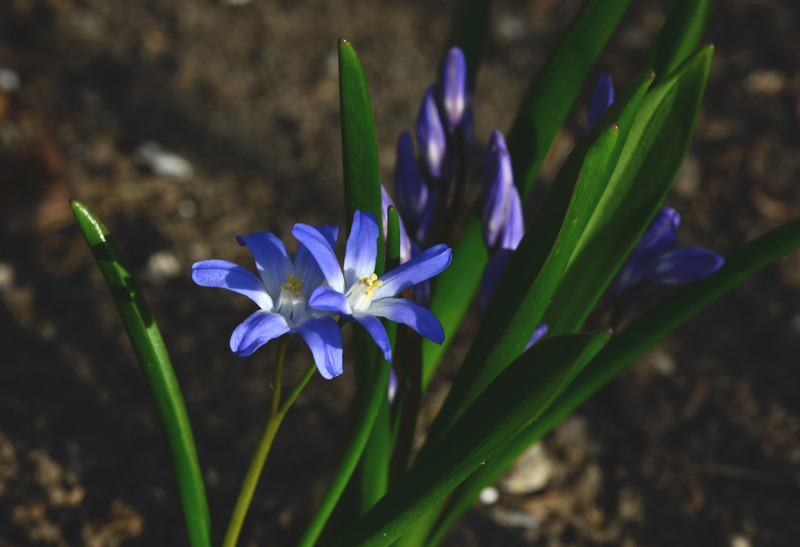 As unpredictable as the weather has been, there are spring flowers that wouldn’t mind a little cold and some snow on the ground. The Snowdrop is one. 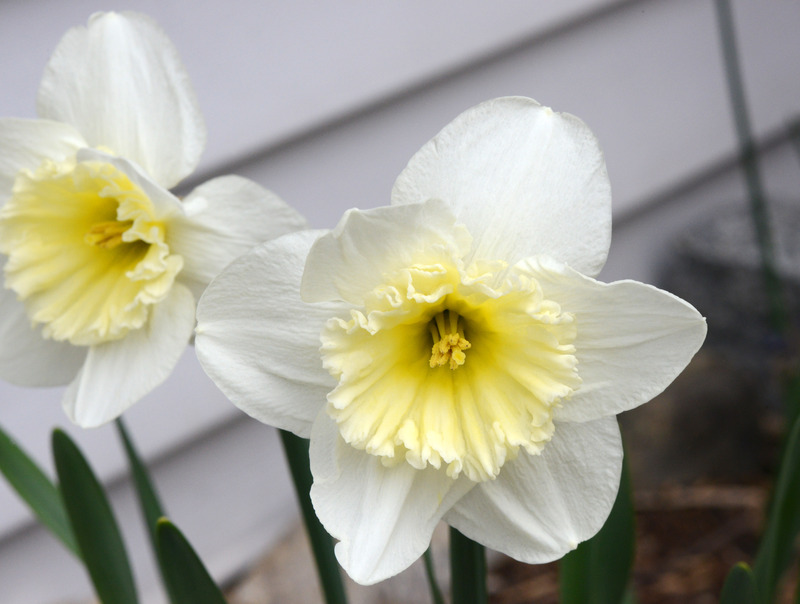 I have only a clump of them in the garden since they don’t have a great variety of colors, just white and green. The other is crocus. They come in many shades and colors. It’s a lovely site to see when growing en-mass in a variety of colors. To get a natural effect, I purchased around 200 mixed crocus bulbs and cast them on the lawn. Then I planted them wherever they landed. The second year, I added the expensive and larger flower types and over 100 more mixed bulbs. Too many? No. The first 200 I put in, maybe only half were able to evade squirrels and chipmunks. We could see a lot of pockmarks on the lawn from them digging up the bulbs. Even when the bulbs have already sprout little leaves and flowers, they still dug them up eating the bulb on the bottom. I made a mental note of any empty patches in spring so I can cast more bulbs in autumn. What the critters missed provides a beautiful effect on our empty, brown lawn in early spring. They also provide an early food source for pollinators. Then they just disappear as the grass takes over. 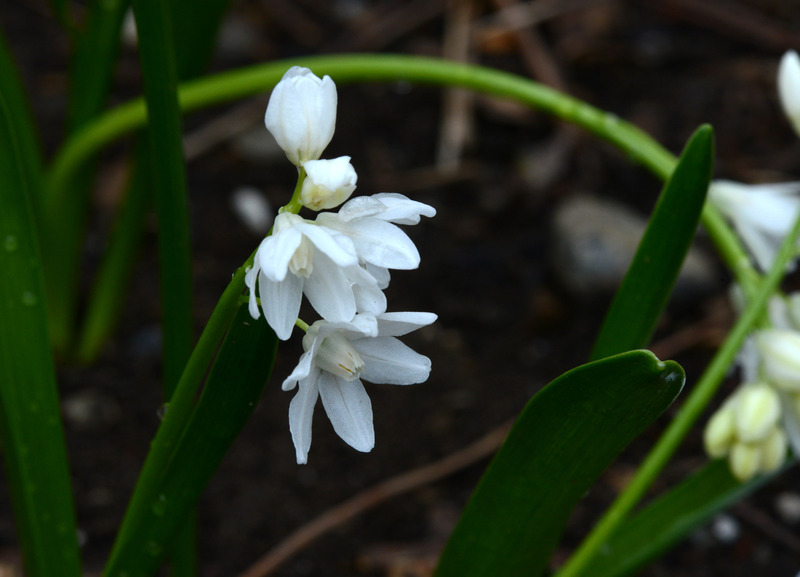 They are easy to grow and each bulb will become a larger clump in just a few years, provided they are not eaten. They need no extra attention, we feed them at the same time we feed our lawn. We also leave our grass clippings on the lawn as mulch for crocus and grass. 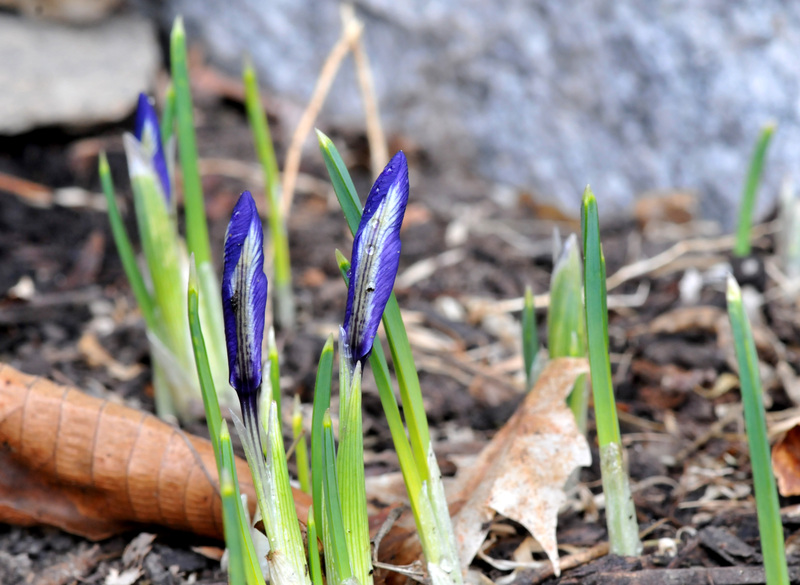 To extend a growing season and add some color in autumn when most of the flowers are fading, plant fall crocus. This type will come up and flower in autumn for you and the pollinators to enjoy. Price comparison on plants that I want to add in spring. New vegetables in the market and what they are good for. These are just some of the winter chores I do. 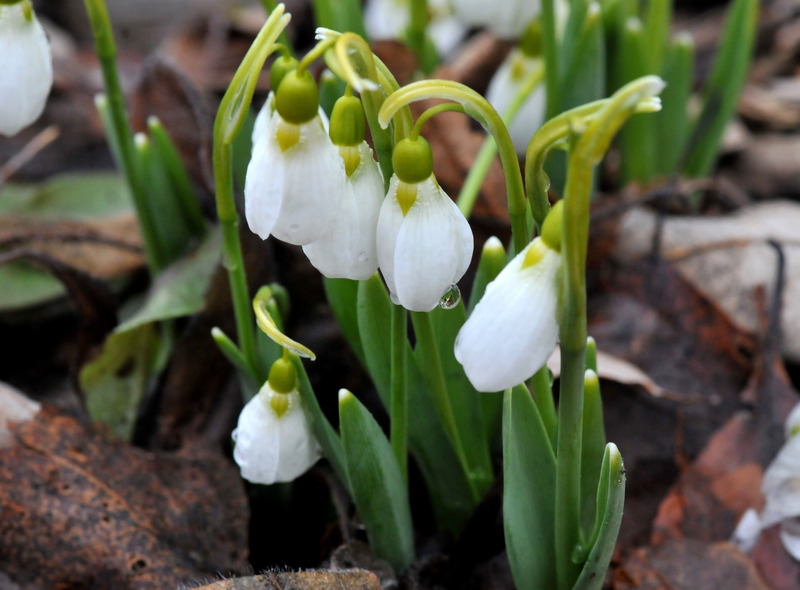 I find myself looking for late winter-early spring flowering plants more often around this time. Maybe it’s just a longing to see colors back in the garden. 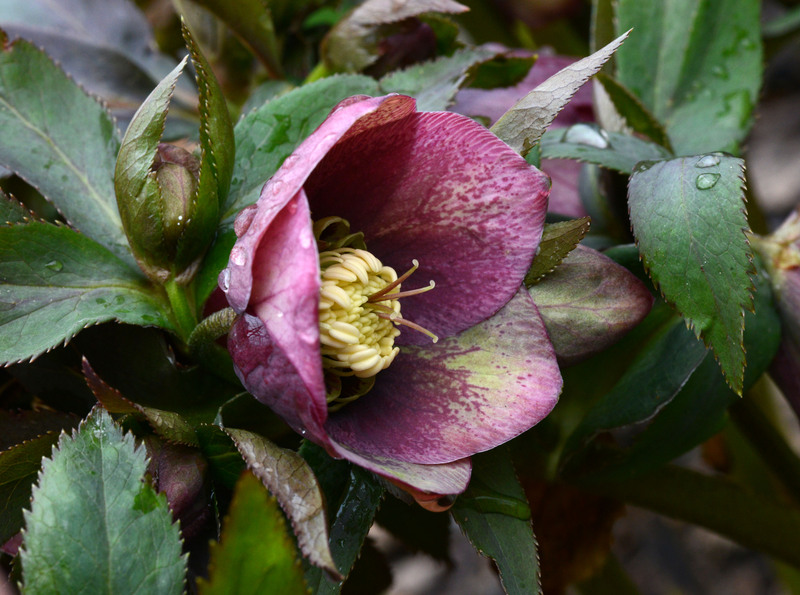 One of the late winter-early spring flowers I fell in love with are Hellebores. Their leaves are almost evergreen and they even bloom before the daffodils. It very effectively self-sows yet never becomes invasive, so I keep looking to add new colors to our garden every year. One plant per color and patience to let it grow is enough. Within a couple of years this one plant will become a patch or a colony if I let it set seeds. I don’t remember the names of the earlier Hellebores I planted. I forgot to note the names down and there are so many colors and patterns out there that I can’t really use mere descriptions to identify mine. With the new batch, I keep name tags and note on color and location down. Below are some of them, forgive me for the unidentifiable ones. I’m open to any suggestions for identifying the unnamed flowers. 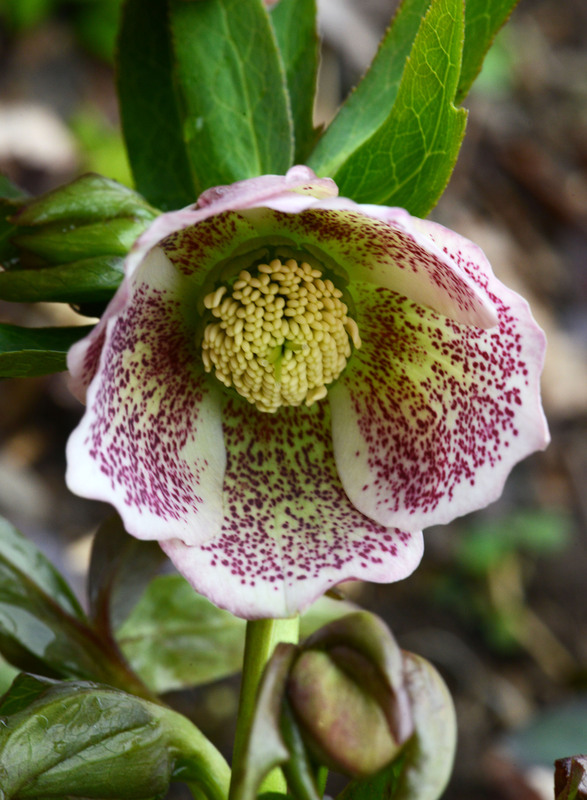 I love them in part because there are so many colorful choices of Hellebores to select from and they also come in single and double layers petals. They are winter hardy, no fuss for drought either. They can be grown in semi-shade. Since they are a low grower, I grow them under the trees, by a rose trellis and along a shady path. They are not invasive. They produce seedlings but the seedlings may not be true to the parents especially when I grow a variety of them close to one another. That’s the fun part of it; I’ll never know what the flowers from any seedling will look like until it blossoms. Pollinators love them; they are a good food source for early spring when other flowers have yet to blossom. If you want to reproduce the ‘exact’ color as the original plant was, you can do it only by division. Dig the plant you want to propagate up and separate an individual from the clump, then replant it. Last year, I added ‘Onyx Odyssey’ to the garden. As the name suggests, the flower is black. I can hardly wait to see it bloom. I’ll keep you posted. I see the spring light at the end of the tunnel, a little dim but still a cheerful light of hope. Snow still covers the majority of the garden but in the bare specks there are colors. Crocuses in the front yard bloomed nicely this year. Last year they became deer food. At least deer left the bulbs alone so they came up with a variety of colors. We planted a lot of crocuses in the previous two autumns to provide early spring food for our honeybees. Many of them became food for squirrels, chipmunks, deer and rabbits but the survivors continue to come up in spring before disappearing underground again. This deep purple crocus was planted by a squirrel. It’s in the middle of the iris plot by the garage. I know I didn’t put it there. Our back yard is still covered with snow but it’s melting fast with high daytime temperatures. Some tulips and daffodils braved the cold pushing themselves up above it. And, look at the busy girls. Yes, we call them girls because the worker bees are all female and they’re like our children. The weather is warm enough for them to go out foraging and most of them came back with baskets full of pollen. They’ve also taken in water from the birdbaths. The majority of honeybees that flew back in carried big loads of pollen. I’ll have to check on them this weekend to see if I have to give them more sugar or not. It’s still too cold to feed them syrup. Spring is here after all. Thank you Mother Nature for giving us a break from the Nor’easter in the last few weeks. 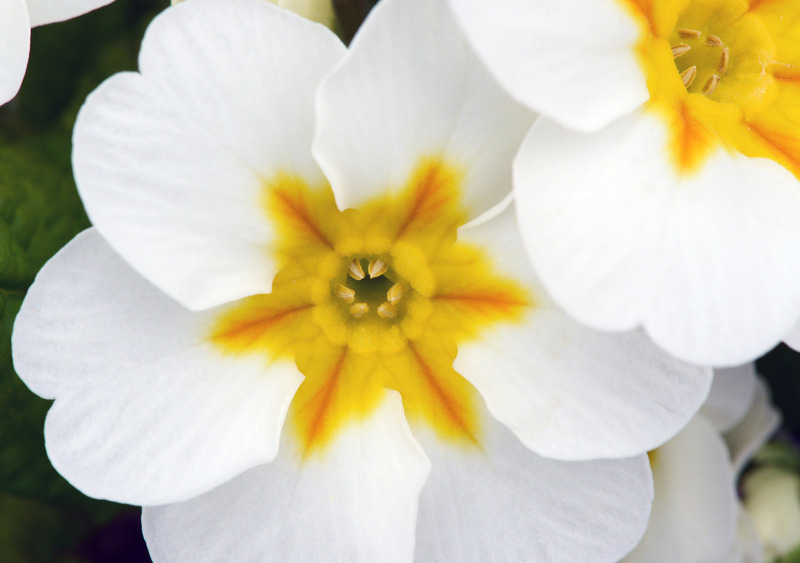 When crocuses and daffodils start to fade, primroses take the baton and continue running, coloring our garden. 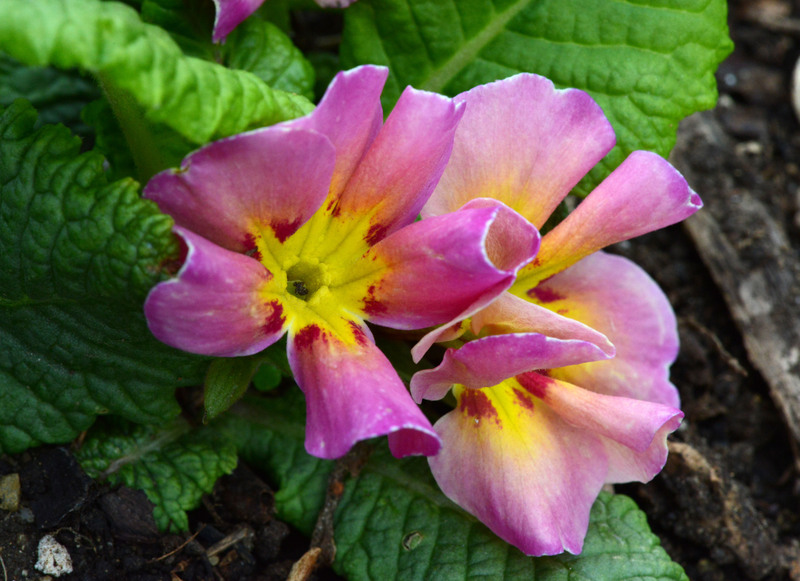 I’ve been planting different colors of primrose in our garden for the last few years and continue to look for new colors every year. 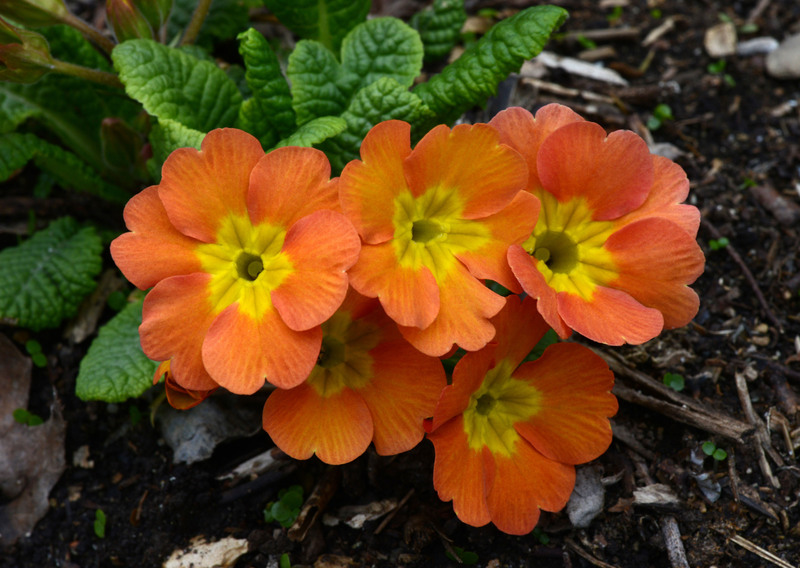 There are many types of primrose but not many are hardy enough for our USDA zone so my choice is a little limited. 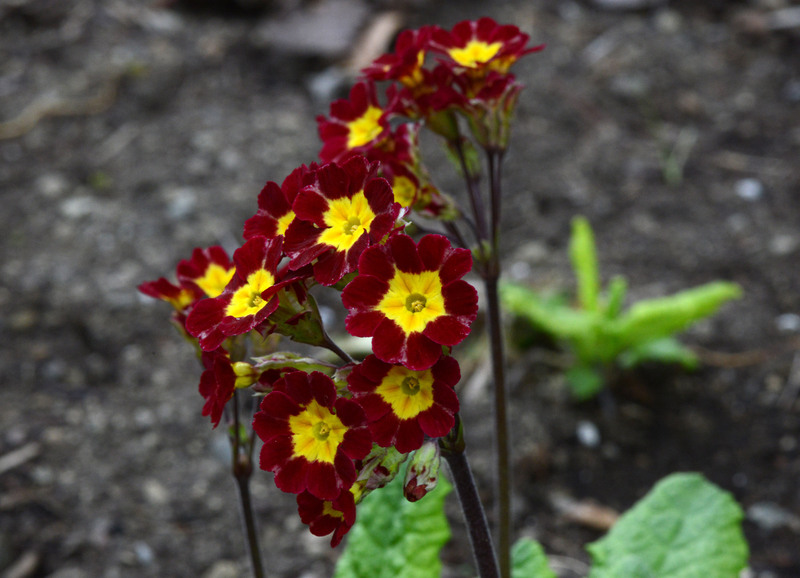 What I like about primrose is that they are pretty and low maintenance. Once I put one in the garden they tend to thrive being fed only once a year, in spring, and with a little mulching. The only potentially deadly problem for primrose, at least in our garden, are the slugs. Since they are low to the ground and tend to like moist soil, it’s easy to reach for the slugs. 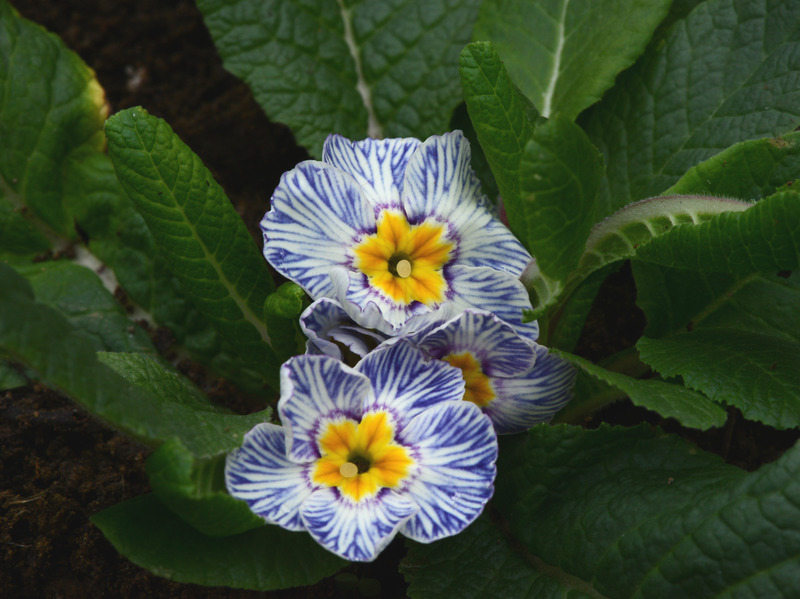 They can make a clump of primrose disappear in a few days. Our previous neighbor gave us a couple of these primroses a few years ago. Now we have a large clump. The orange and purple striped ones were devoured by the slugs. The green one is still budding, not yet open and we’re hoping the slugs miss it too. 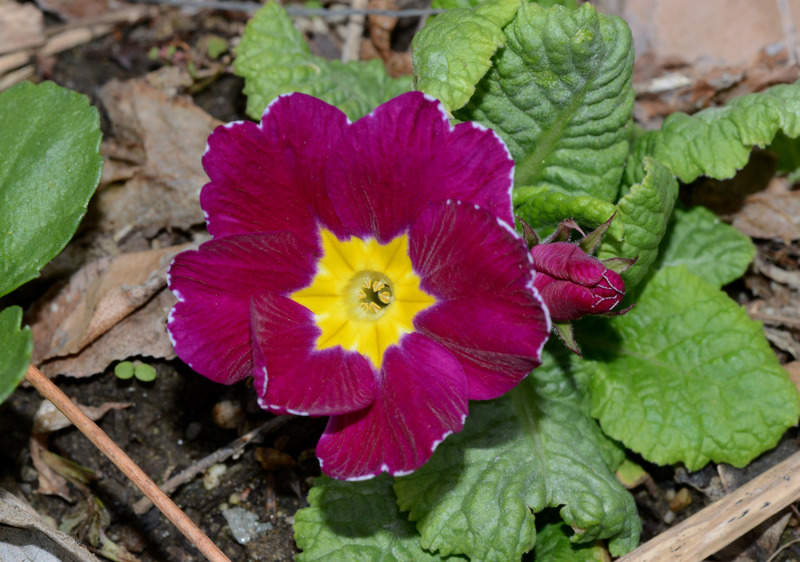 For a couple of weeks or so, we have a very welcome primrose color all over our garden. 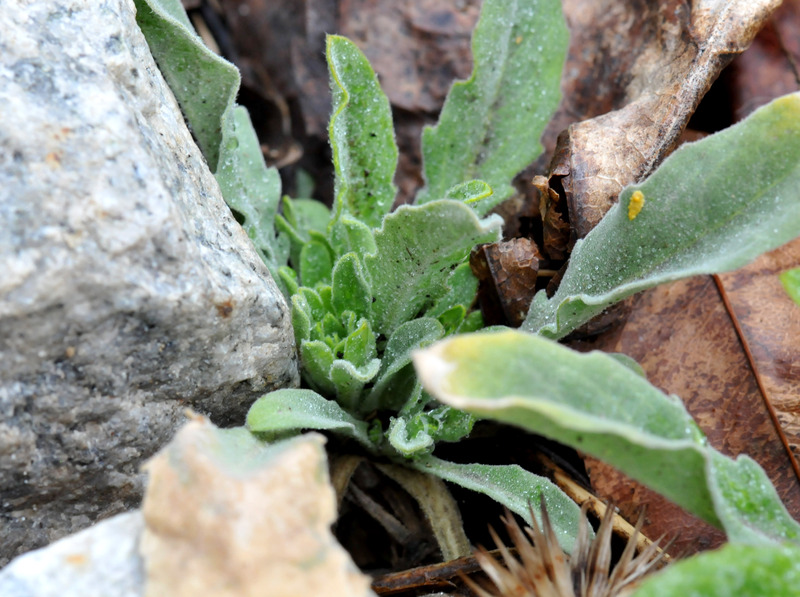 When spring weather has not stabilized and frost is not yet out of the picture, not many plants are well equipped to deal with left-over extremes. 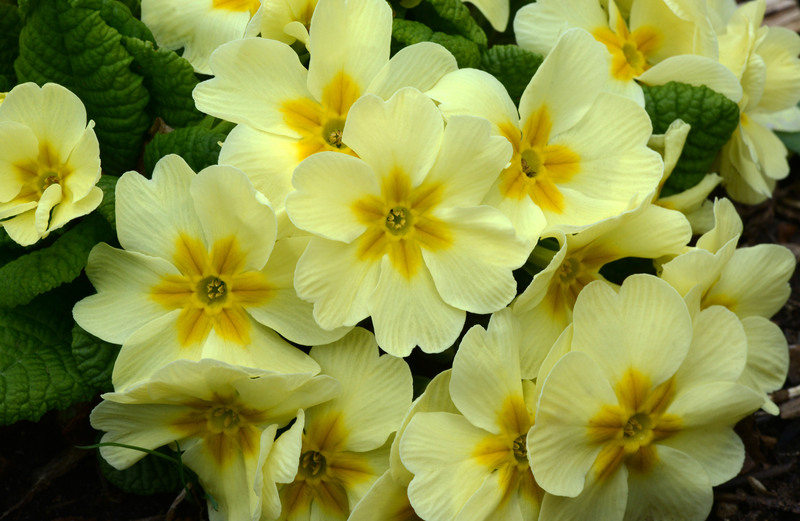 Primrose (Primula) is one of the early spring flowers that can deal with a wider than normal range of temperatures. Recently the temperatures locally have been around 60° to 75°F during the day, dropping to below 40°F overnight. These little plants are thriving even though some of them started as little more than a root. Deer found them tasty this last winter; chewing them right down to a stump. Some were pulled from the ground but still hung on until I found them and poked them back in the ground. Their blooming also lasts a long time. 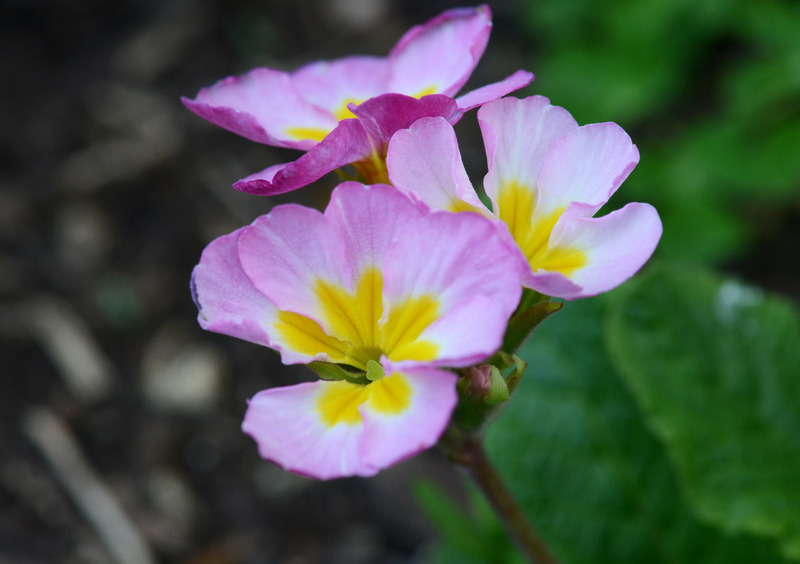 This spring has been good for the primrose since it’s still too cold for the slugs who come out at night, so the leaves and petals are still intact. This orange came back to life after slugs reduced it to little more than two leaves. This yellow colored one produces a mound of flowers. I’ll have to divide it this year. Not much to say about this one aside from ‘amazing’. A lot of flowers, even the one that was chewed to its base. This burgundy one retains its dark color and has longer flower stems. Curly petals with large flowers. Paler pink, without red mark and longer stems. Spring is finally here, though a little too cold for April. There are plenty of things to do in the garden and most of them are time sensitive. 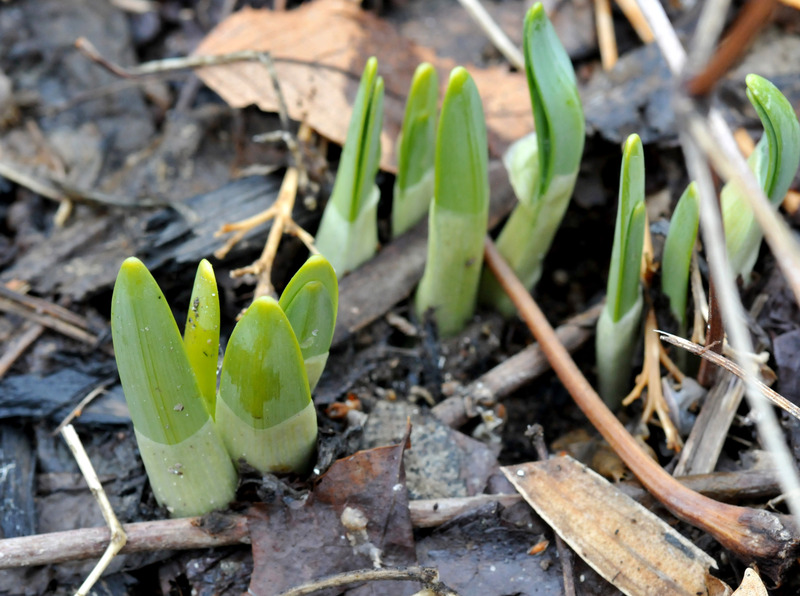 Cleaning up dead stalks, feeding, pruning, training, mulching, starting the seedlings…they all need to be done at certain times in order to be done correctly and to be good for the plants. Two days off from work, from dawn to dusk, seems to be too short a period of time to get them all done. Something has to go on the back burner. I started seedlings like tomato and chili pepper at dusk and working into the night. After pruning, training and feeding the roses, I have other perennials that are waiting in line to be pampered. Then I sow cool weather vegetable seeds like arugula, radish, carrot, chard, kale and sugar snap pea in the garden. After all these chores, a good hot shower and a glass of wine, then I sleep like a baby. As much as I love to blog I have no physical energy left, though I remain mentally clear and calm and want to share what nature is providing me. So I apologize for not updating this blog in a more timely fashion. Call it planting season time requisition, for lack of a better term. 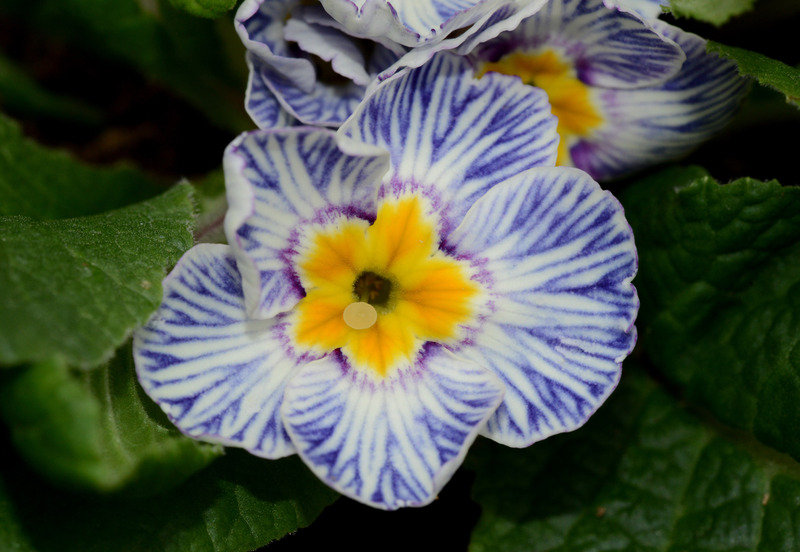 Here is one of my new acquisitions this year: a Blue Zebra Primrose (Primula acaulis ‘Blue Zebra’). It’s a lovely addition to my primroses. Came back from vacation with hope to see some green and a little more warmth than when we left, but didn’t expect the temperature to be just like the tropics where we vacationed. It has been in the 70s in the last couple of days and the plants love it. There wasn’t much of anything above ground when we left, but now everything is sprouting up all over the garden. Garlic I put in last October has come up pretty nicely. 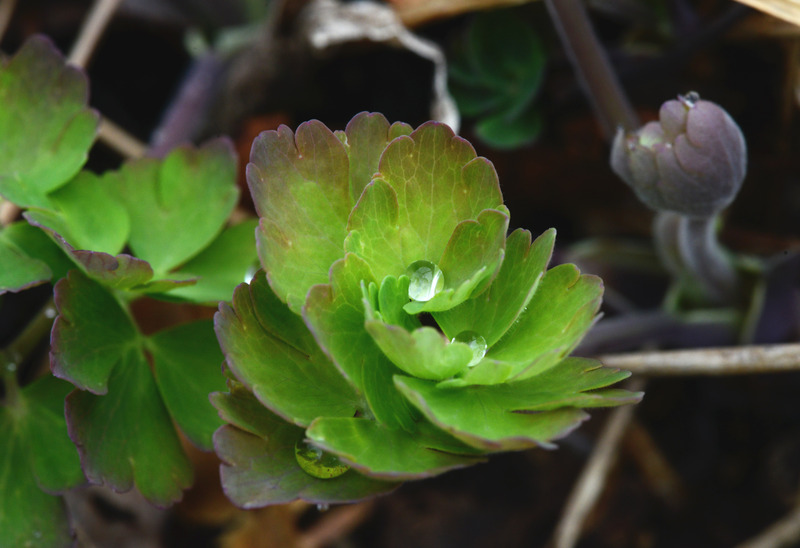 Hellebores perk up in the morning only to wilt a little under the afternoon sun. 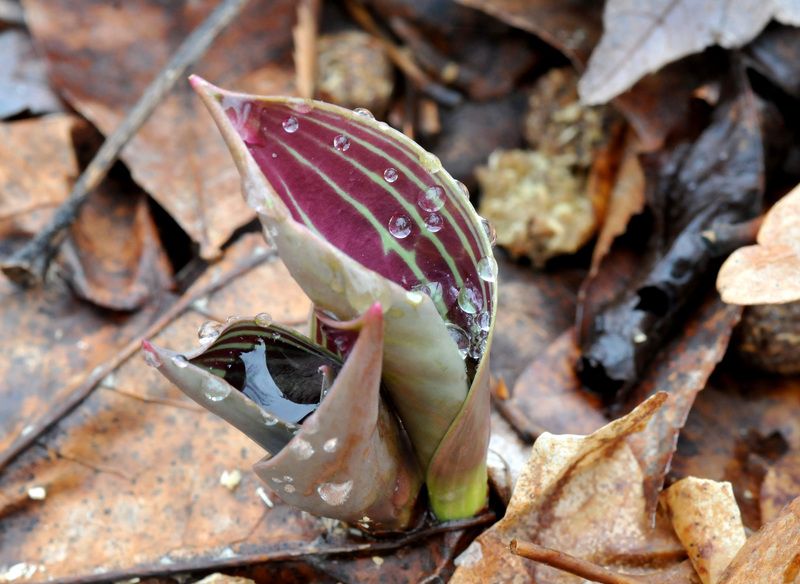 Daffodils, Dutch Iris, Hyacinth and Hellebores are either blooming or just about to unfurl their petals. I spent hours on my day off pruning and training the roses and haven’t finished yet. This is a time consuming task as well as a time constraint. If I don’t do it now when the roses are just starting to push out their little buds, it will be a lot harder to do when they have leafed out fully. Deer have done a lot of damage to the tips of plants that came up early, including Irises. Who said deer wont eat Iris? But the worst damage to our garden is caused by squirrels that dig up the tulips bulbs, eat them and leave us the leaves to rub into our wounds. Aside from the annoying squirrel problems, I’m glad to see color in the garden and the aerial show from our avian friends again.